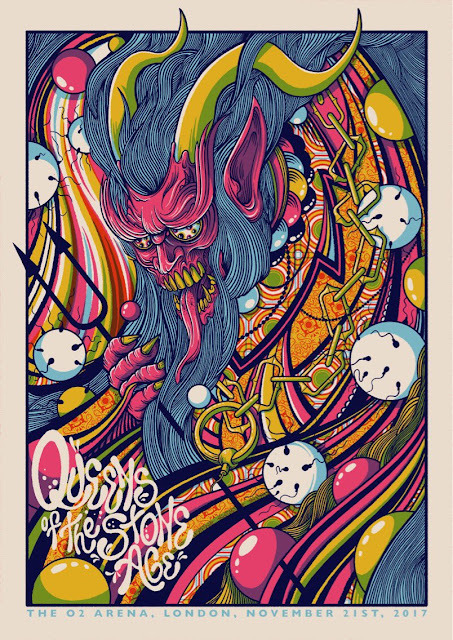 Queens Of The Stone Age: Live @ London O2 Arena 21/11/17 - For Your Reading Entertainment. "There is no present or future, there is only now." Josh Homme, the leader of the worlds most successful rock n roll gang, Queens of The Stone Age, is in a philosophical mood, and visibly moved by the seismic reaction they've just received to opening tracks If I Had A Tail and Monsters in the Parasol. "It's time to cut loose". Homme has reason to be reflective of course. Having secured a UK number one album with their swing inspired record Villains, QOTSA have successfully navigated well over a decade at the pinnacle of rocks mountain and show no signs of stopping. Now in their natural habitat of cavernous arenas, the desert dwellers unload a treasure trove of hits upon those in attendance. My God is The Sun inspires a frenzied reaction, Feet Don't Fail Me and The Way You Used To Do prove the new material can hang with the heavyweight tracks from the past, and if there was any doubt, Millionaire makes an appearance to remind people that when this band hit the accelerator they're pretty much untouchable. Homme is famed for his ability behind the microphone, not just for his abilities as a rock vocalist, but for his talents as an entertainer, and he is on top form here tonight. "I come bearing good news, it's Saturday night!" "Get loose, take your pants off". His friendly, yet direct tone prove motivation enough for most of the arena to lose their minds for the entirety of the set. In fact it takes new cut Villains of Circumstance for things to simmer, with the epic I Appear Missing bringing proceedings dangerously close to boiling over. It's the bands final flurry which really cements their position as the worlds finest rock band. Little Sister, Sick Sick Sick, Go With The Flow, Regular John and A Song For The Dead. It's a series of tracks which speaks for itself. With a massive Finsbury Park date just announced in which Iggy Pop has been named as a support act (!?) QOTSA are at warp speed and showing no signs of slowing down. This rock n roll gang are taking over and there is nothing you can do stop them. The evil has well and truly landed.